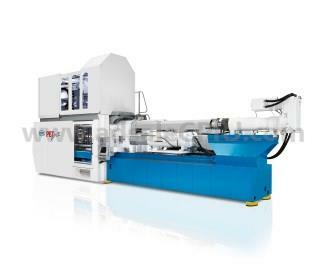 Netstal, a division of the KraussMaffei Group, will offer details of its injection molding machines and systems for various packaging applications at Interplastica 2014. The company presented three world premieres at drinktec 2013, the PET-LINE 2400, PET-LINE 4000, and the ELION 4200. According to its release, Netstal will be delivering the first ELION 4200 and PE-TLINE 2400 machines to customers in Russia this spring. “It is especially in the beverage packaging, closure and thin-wall packaging sectors that Netstal is a forerunner on the Russian market when it comes to energy-efficient and cost-effective production,” said Zachar Antonovsky, Divisional Director of Injection Molding Machinery and Reaction Process Machinery in Russia and Commonwealth of Independent States (CIS). With the new PET-LINE 2400 and PET-LINE 4000, Netstal said it makes cycle times even faster and massively increase output. The new ELION 4200 is based on the company’s hybrid drive, Eco Powerunit to realize energy-saving potential. Its double-valve technology is said to achieve an injection speeds of up to 2,200mm/s, which results in material savings, faster cycle times and reduced production costs. “In order to serve our customers even better and more quickly, our stock of spare parts in Russia is being expanded and further positions created in the service sector,” added Zachar Antonovsky. Interplastica 2014 will be held from January 28-31 in Moscow, Russia.